Don’t You Want to Be Friends? When you consider the day-to-day life of your pampered kitty compared to her cousins in the wild, it is instantly apparent that many house cats today live a rather humdrum existence. While a feline in the wild spends most of her waking hours hunting her next meal and hiding from predators, the cat on your couch has nothing more to do than check to see if you've scooped her litterbox today. There's no debate that most indoor-only cats are far safer than outdoor cats. The downside, however, is that indoor kitties who are bored and under-stimulated can develop behavior problems such as aggression. Aggression is actually a very common complaint of cat parents, and according to Christensen, stranger-directed aggression is probably an underreported type of feline aggression. If little Fluffy is hostile to strangers, it can negatively impact the close bond you share with her. In addition, she might actually hurt someone or another animal, and she won't be too popular at the vet's office or with your pet sitter, either. Aggression toward strangers often occurs as a cat becomes socially mature, though it's also seen in some kittens. Kittens should be socialized, and especially in a young cat with aggressive tendencies, positive experiences with strangers should continue throughout life. If your cat is over the age of 3 and the environment you provide her is stable, any sign of stranger-related aggression should be addressed right away. The first thing you'll want to do is make an appointment with your veterinarian to rule out an underlying medical condition that could be causing the behavior. One of the first (and sometimes only) signs that a cat is sick or in pain is a change in behavior. Feline diseases that can increase irritability include infectious agents, hyperthyroidism, hypertension (high blood pressure), osteoarthritis, certain types of cancer and others. Your vet should perform a thorough physical exam and order a complete blood count (CBC), blood chemistry profile, thyroid assessment and urinalysis. He or she will also want to evaluate your kitty for infectious disease, signs of pain, blood pressure abnormalities and cognitive dysfunction. Assuming your kitty receives a clean bill of health, it's time to try to identify what's triggering the aggression. Your kitty may begin to perform these behaviors repeatedly on a daily or weekly basis. Or she may spend much of her time hiding, except when she emerges to be aggressive with behaviors such as hissing, swatting, growling and/or biting. According to Christensen, stranger-directed aggression in cats is typically triggered by fear, territorialism, petting and/or play. Treatment should include avoiding triggers, providing a safe space for the cat, desensitization and counterconditioning and environmental enrichment. What you absolutely do not want to do is punish your cat for aggressive behavior. Punishing a cat with aggressive tendencies can result in increased aggression, which is not only very stressful for your kitty, but can also really muddy the waters in your effort to identify the triggers for her aggression. It can also result in injury to you, and increased fear and anxiety in your cat. Avoiding triggers in a cat with aggression toward strangers means eliminating her access to strangers, at least initially. Provide her with a safe space that mitigates behavioral arousal and also isolates her from visitors. Reducing behavioral arousal is key, because as Christensen points out, once a cat is aroused, she can remain that way for hours or even days. Kitty's safe space can be a separate room in your home, a crate if she normally uses one (or if you can train her to use one), a cat condo or some other arrangement. The idea is to give your cat a special spot where she feels secure, and reward her with petting, praise and treats when she uses it. I also find Jackson Galaxy's Safe Space blend beneficial to use. Put her in her secure spot before guests arrive and allow her out only after they leave. The length of your guests' visit will determine how well outfitted kitty's safe space will need to be. Let your visitors know not to look at, talk to or pet your cat. Since it's really not practical or healthy to keep kitty isolated forever from any and all strangers and it also doesn't help her learn new ways to respond, it's not the best long-term solution for all but the most intractable cats. Once you know your kitty's warning signs and specific triggers, for example, the sound of the doorbell, being petted, loud voices, the scent of another cat on a stranger, etc., you should consider desensitization and counterconditioning. If you're not confident you can go it alone, I recommend talking with your veterinarian or an animal behaviorist who can help you help your cat learn to be more comfortable (or less hostile, at least) around strangers. "Environmental enrichment is a critical component of keeping cats behaviorally and medically healthy," according to Christensen, and I absolutely agree. This applies to virtually every indoor kitty, not just those with aggression or other behavior issues. In the wild, cats not only hunt prey, they are prey for other animals. They feel most vulnerable while eating, drinking or eliminating. This vulnerability is what causes a fearful response when a cat's food dish or litterbox is in a noisy or high traffic area. The essentials of your kitty's life — food, water and his bathroom, should be located in a safe, secure location away from any area that is noisy enough to startle him or make him feel trapped and unable to escape. Cats are natural climbers and scratchers, and those urges don't disappear because kitty lives indoors. Your cat also needs her own resting place and a hiding place (sometimes these are the same spot) where she feels untouchable. Cats prefer to interact with other creatures (including humans) on their terms, and according to their schedule. Well-balanced indoor kitties are given the opportunity to feel in control of their environment. Jackson Galaxy has written several books on creating feline environmental enrichment around the house that I highly recommend. Your cat feels most comfortable when his daily routine is predictable. Performing little rituals when you leave the house and return can help kitty feel more comfortable with the comings and goings of humans in the household. A ritual can be as simple as giving him a treat when you leave and a good scratch behind the ears as soon as you get home. Playtime should also be consistent. Learn what types of cat toys he responds to and engage him in play, on his timetable. Of course, while you can encourage him to play, it's pointless to force the issue. Visual stimulation: Some cats can gaze out the window for hours. Others are captivated by fish in an aquarium. Some even enjoy kitty videos. Auditory stimulation: When you're away from home, provide background noise for kitty that is similar to the ambient sounds she hears when you're home, for example, music or a TV at low volume. Olfactory stimulation: You can stimulate your cat's keen sense of smell with cat-safe herbs or synthetic feline pheromones. This can be a sensitive area. The way cats interact with each other is very different from most other animals. Trying to predict how two or more cats will get on living under the same roof is nearly impossible. Females tend to get along better with other cats than males do, and intact males can be a special challenge in a multi-cat household. Problems with inter-cat aggression can arise when a new cat is brought home, when two cat owners blend their feline families and even among cats that have lived peacefully together for years. Because of the complex nature of feline social structures, if you have a multi-cat household and there are problems, or you're hoping to add a new cat to the family, I recommend you talk with your veterinarian or an animal behavior specialist. Often there are things you can do to minimize problems with aggression or other undesirable behaviors. Ideally, your kitty gets to spend some time outdoors in nice weather in controlled situations such as on a leash walk, or inside a protective enclosure. 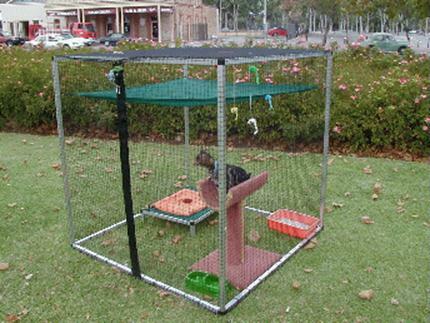 The enclosure (sometimes called a "catio" or "cat patio") can be as simple or as deluxe as you like. The idea is allow kitty safe access to the outdoors, as well as the chance to put all four paws on the earth. Safe access is key. Allowing your cat to run around loose outside is never a good idea. It presents much more risk to his health and longevity than keeping him indoors. Kitties with free access to the outdoors are much more likely to be exposed to disease, poisoned, hit by a car or attacked by dogs, wild animals or other cats. Previous Article Don’t You Want to Be Friends? Next Article What Makes Frog Tongues So Sticky?